Right before this year's Tokyo Game Show, Nintendo suddenly revealed it was having a press conference. It was a total bust. Today, Nintendo suddenly announced it was holding another press conference. Will it be a disappointment, too? 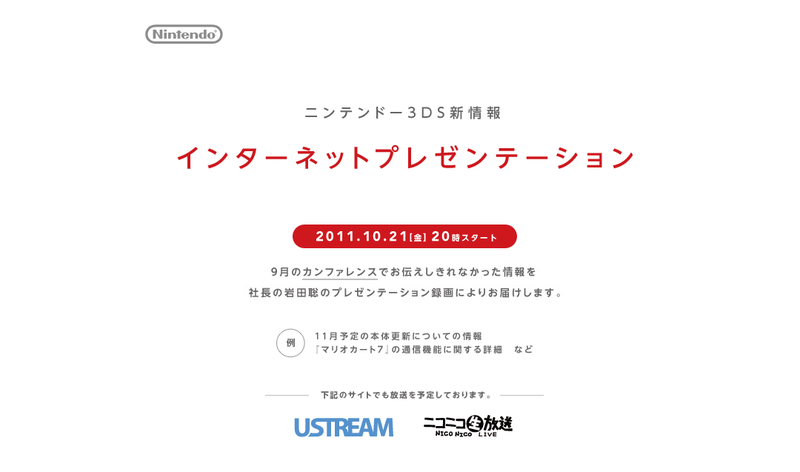 Dubbed "Nintendo 3DS New Information: Internet Presentation", the event will be carried over Japanese video site NicoNico Douga and Ustream. Satoru Iwata, Nintendo's president, will give the presentation According to Nintendo, this Friday's press conference will showcase "new Nintendo 3DS news" that it was "impossible" to announce during the pre-TGS event. During the pre-TGS event, Nintendo did not reveal pricing and a release date for the 3DS Expansion Slide Pad, but snuck that information out via its website. According to Nintendo, topics at the new conference will include details about the planned November update for the Nintendo 3DS as well as more information about Mario Kart 7 features and functions. There has to be a surprise or two, especially if this press conference isn't to be another let down. Will Nintendo announce a new 3DS revision? Or will the 3DS get another price cut? Stay tuned, we'll find out Friday.